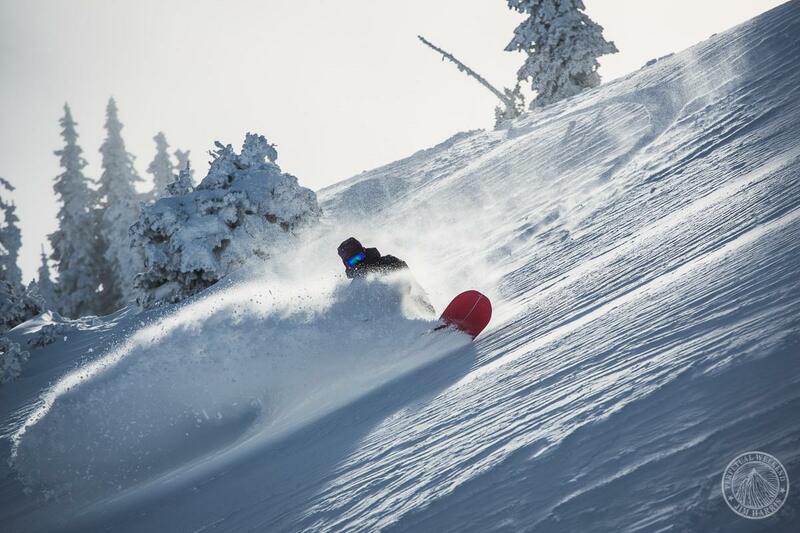 Committed to reducing his environmental impact as a devoted snowboarder, Salt Lake-based Tony Pavlantos has gone farther out of his way than many would even dream of to do so. Gabriel Ciafre photo. Tony Pavlantos, like a lot of skiers and snowboarders, cares a great deal for the snow and the natural world in which he gets his greatest highs and most fulfilling experiences. Any person who's spent seasons like Tony has–riding 200 days during the winter, and another 40 in the summer, with lots and lots of pow mixed in–would have to. But almost no other person you might meet in the mountains has acted upon that feeling of responsibility to the mountains like Pavlantos has. Over the past two years, he's weaned himself off of cars entirely, and does practically everything on a bike. Practically everything. 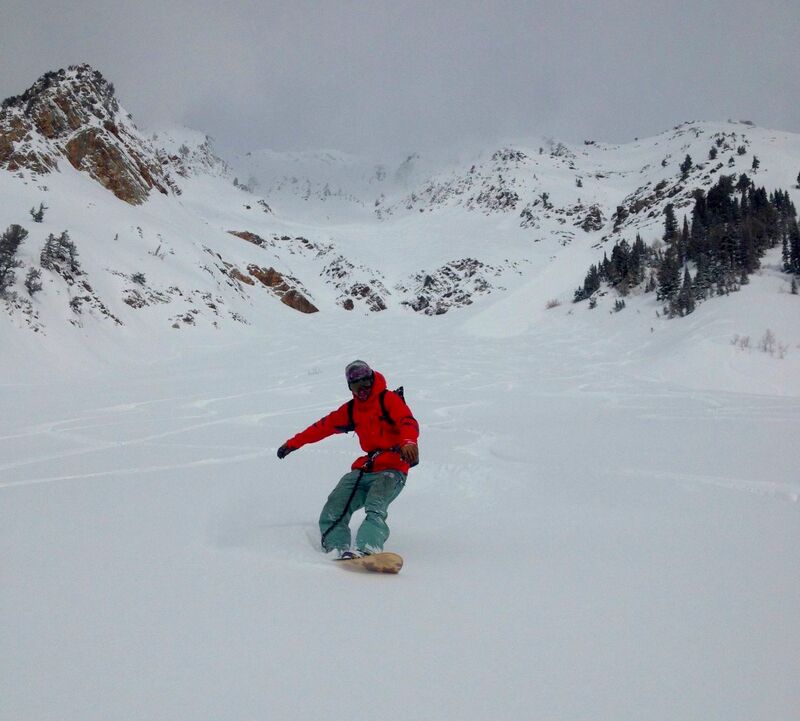 He pedals up Little Cottonwood Canyon to go splitboarding. 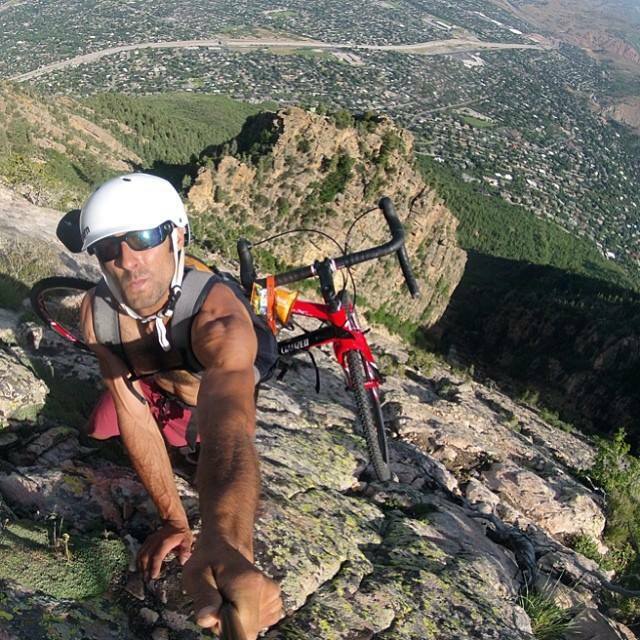 With a homemade rig, he tows stacks of pallets behind his bike across Salt Lake to his design studio. Last winter, in the middle of February, he even biked from Salt Lake City to Jackson Hole to go snowboarding, towing a 400 pound metal tub along with him so he could enjoy hot tub soaks after his long days bootpacking couloirs and riding pow. "The huff on the bike was an enlightening eye-opener," Tony said in an interview with Editorial & Community Manager Ryan Dunfee. "I’ve never moved so slow in my life; I could have been walking faster." You did a pretty crazy trip up to Alaska this last winter, right? I actually had an amazing drive up in a veggie-powered diesel truck through Canada, and I’d never skied through Canada, so we hit Revelstoke, Nelson—all the way to Alaska was epic waist/chest-deep snow, but once we got to Alaska we had some hairy snowpack—we kinda struck out in AK. We had a wood fired hot tub with us in the truck, so we had some relaxing moments after our skiing—that was an experience. Weren’t you pedaling that hot tub up there or something? 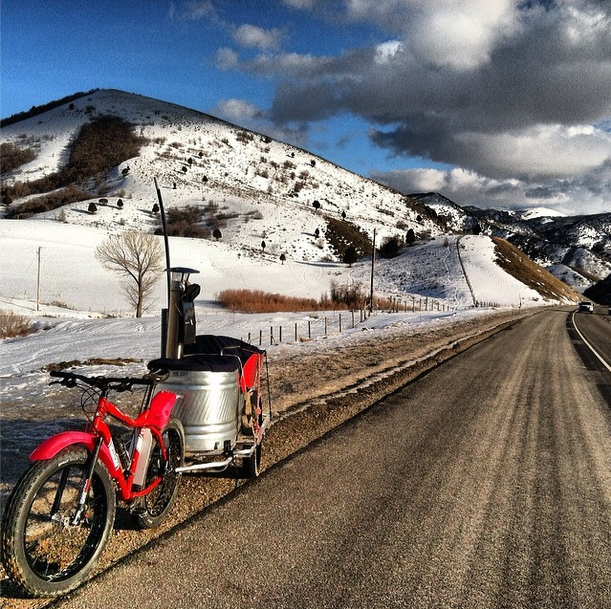 Yeah, I pedaled from Salt Lake to Jackson Hole with the hot tub on a fat bike in mid-February. And then I tried to get to Bozeman Montana for a big objective that I had, but the roads were way too gnarly to keep pushing forward, then I had a malfunction with the trailer, so ultimately it was time to start heading north in the veggie truck and we switched gears. The huff on the bike was an enlightening eye-opener: I’ve never moved so slow in my life, it was like, I could’ve been walking faster, so I saw things you wouldn’t even see normally when you're walking. Like, "Wow, this bug is going faster than me." Or seeing that the water in the stream beside me was flowing so uniquely. It was actually, somehow, pretty amazing. Even in February, you weren’t focused on how cold and miserable you were? Um, I think I was so concentrated on pulling 400 pounds behind me that the torrential down-pouring rain and snow was just kinda part of the added experience [laughing]. I'd soak through a few Gore-Tex suits, and after the third one I called it a day and put up a tent—it was pretty ridiculous actually. Why did you decide to do that and tow the hot tub at the same time? There's a little love story behind it I guess. 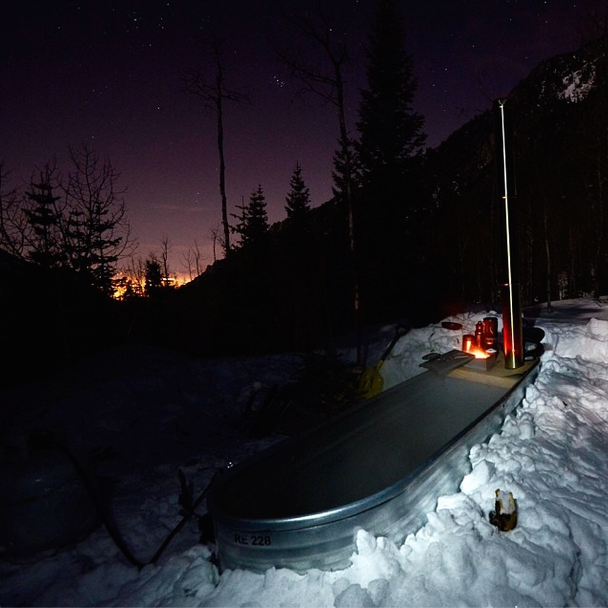 I wanted to give this lady that I met a nice relaxing experience up in the hills, so I made a backcountry bathtub to take on ski tours. That was the start of it, but I didn’t want to let the thing just sit here all winter, so I decided to take it with me. When I got to Jackson, I set it up on my buddy’s front lawn downtown. I just rode pow all day and then soaked in the tub. After a big ski day, the whole hot tub/hot spring thing just does wonders for me. And I was planning on spending two weeks up in Bozeman riding backcountry and snow camping, and it's so cold up there–I needed a way to heat up. I don't know; it's just been something unique to keep my drive alive in the snowboard world. Are you at the point where you need to do super self-creative missions to keep the stoke alive? Tony finishing up a 2,900 foot noboard (i.e. no bindings) run off Mount Superior in Little Cottonwood Canyon–a possible first pow surfer descent with partner Gabriel Ciafre, and one of Tony's "creative missions." Gabriel Ciafre photo. Well, my big focus in life is my environmentalism. Self-sufficiency is pretty key to me, and I think I become more in tune with the communities I live in when I’m self-reliant. I become more involved in the human aspect, the human factor of it, and that’s enjoyable to me. I think the whole ‘travel around the world’ thing is great, but really, what are you giving back? I’d like to try and give back where I can. It’s really a way of life for me not having a car—I just do my thing. Exposed, big alpine terrain, lines that I’ve set out for—training is absolutely essential. So riding a bike everyday and commuting in that manner is really the only way that I feel like I can have the time to train hard enough. It’s my way of staying on point, fitness wise, to get up into the terrain that I’m trying to access. How long have you been without a car? 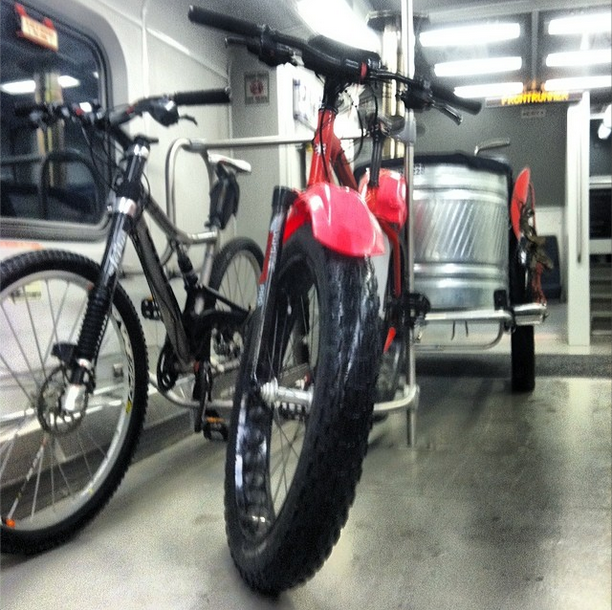 A shaky Instagram shot showing Tony's loaded hot tub fat bike rig on public transit in Salt Lake headed for Jackson Hole. About two years. Not having a car has actually made me choose my terrain and my objectives selection pretty precisely. So, I set a goal, I find a crew and we go up and do it. I’ve noticed that when I have a car, we just go up and ski everyday. I still go up and ski, but I have something that I work towards. In that sense, the days I have on the snow are more productive. Is it hard to find partners with a similar mindset? 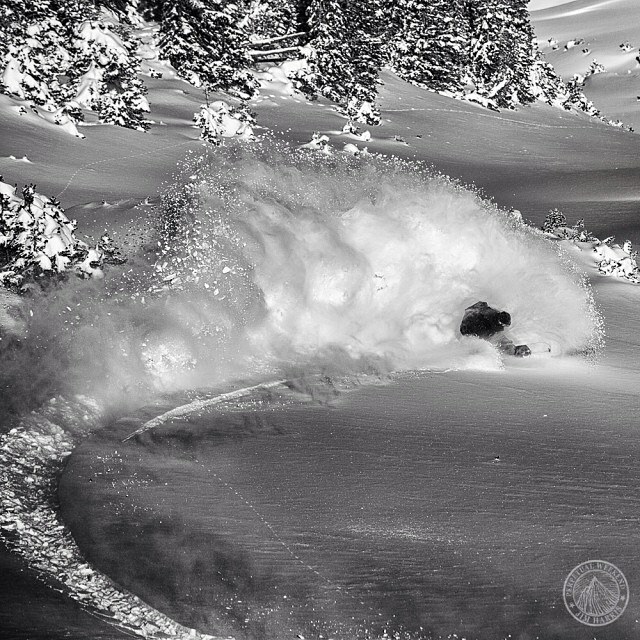 Tony with a 100% human-powered pow slash in the Wasatch. Jim Harris photo. I think there are people out there with a similar mindset. The whole bicycle thing is really hard, although I do have some skier friends who are starting to get into the whole bike touring/skiing. It’s really hard because I’ve been trying to broaden my disciplines in order to have a vast proficiency in getting around the mountains, around the world, where most people just focus on one. Having the ability to ice climb, to rock climb, and spending two decades on a snowboard, it is hard to find somebody that has put that much time into this many disciplines mixed together. How long does it take to melt snow and get that hot tub up to dipping temperature? 11 hours later, and you're ready to soak at the bottom of your ice climbing route/couloir! Tony Pavlantos photo. I’ve only melted snow into water once—and I’ll never do it again. I put snow into the hot tub, started up the stove, put a propane heater underneath, and it took eleven hours. If you set it up next to a stream or lake and pale the water in and heat it up, it’s about three hours. Do you feel like you’re a masochist at this point? It’s not so much masochism. I think it’s more just that I love being in tune with what my body can do. I’ve spent so much energy honing the most lightweight setup, building my own gear that’s lighter than any gear on the market so I can actually succeed in pulling off some of the things I do. It’s more just becoming self-reliant. When I get into a car I have crazy anxiety. I do it to slow things down—we live in such a fast paced world. Imagine settling across the United States and pulling a carriage. A bicycle can kind of simulate that. I don’t really see it as a sufferfest at all—ultimately, I’m trying to get to the point where I’m not suffering. 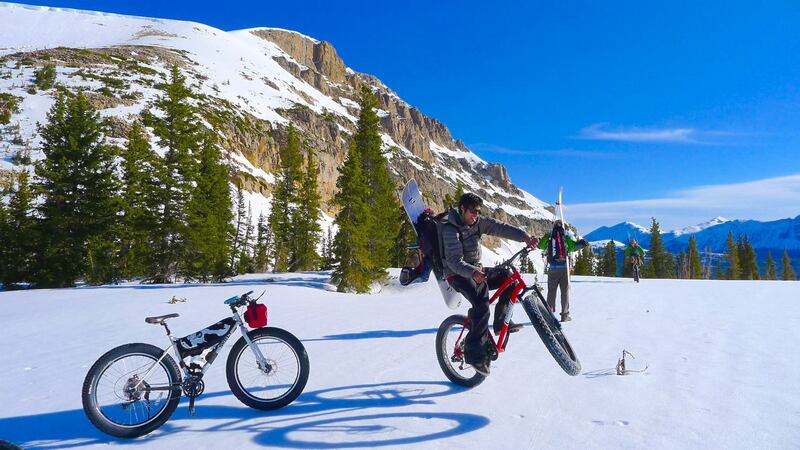 Does the biking give you some perspective about how much energy it takes to chase snow around the world? Tony on another one of his insane human-powered missions–this time, he rode his cyclocross bike from home all the way up the canyon, free solo climbed over to the next canyon, biked down and up to the other side of the valley, and repeated the climb/bike canyon leap two more times... before biking home. Tony Pavlantos photo. Yeah, I mean, the amount of energy it takes to move a body around the world is pretty astounding, and I feel that there has been a certain group that has been able to enjoy the ability to do that for awhile, but ultimately I feel like that era is coming to an end. It’s really about dialing things in where you are, and about being patient enough to wait for it to be good. Whenever I get to go to Alaska, we’re up there for two months–long enough to wait for it to get good. And some people fly in for one week and get to shred spines every day and fly out, and it’s like “Wow, that’s incredible.” And other people spend the entire week at the bar waiting for the weather to clear. It's about achieving more of a balance. I realized there's other things I need to be working on other than giving myself the ultimate freedom of the hills and that spiritual experience. I've been getting that long enough that it's time to give back. I feel like, also, for me it's about achieving more of a balance. I realized there's other things I need to be working on other than giving myself the ultimate freedom of the hills and that spiritual experience. I've been getting that long enough–years where I've ridden over 200 days in the winter and another 40 in the summer down in Argentina guiding with SASS Global Travel–that it's time to give back. On that note, you're just about to start your own backcountry tools company, right? 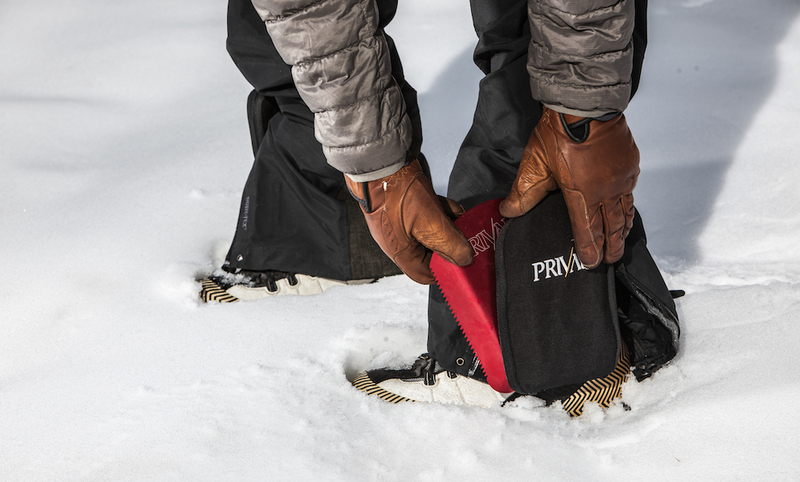 Yeah, actually this Saturday the 15th we'll be launching the full site for Prival USA, which will be offering more sustainably-made backcountry tools developed and built right here in Salt Lake and which are lightweight and compact enough to git in little saddlebags on your boots. I've been wanting something that would really help me have a lighter and lower-profile setup in the backcountry, to really maximize all the effort I've invested in preparing myself for my objectives and the Prival tools like the Sierra shovel (above), which also has a saw edge and cuts up blocks of snow efficiently, still pares down to a size that fits around your ankles cleanly. What’s going on with the Athletes For Clean Air project? Salt Lake City "air quality" during a smogged-out inversion. Tim Brown photo via Flickr Creative Commons. Well, it started as a community Facebook page. A friend messaged me and suggested we start a page for all the athletes—she called it Athletes For Clean Air. I immediately jumped on board and co-founded it with her. Right now we’re a Utah nonprofit; we just try to get pro athletes, any athlete to participate. It turned out to be a great media resource, in the first month we had thousands of likes. The site allowed us to pump out some information that other organizations were struggling to get out because they didn’t have any followers. 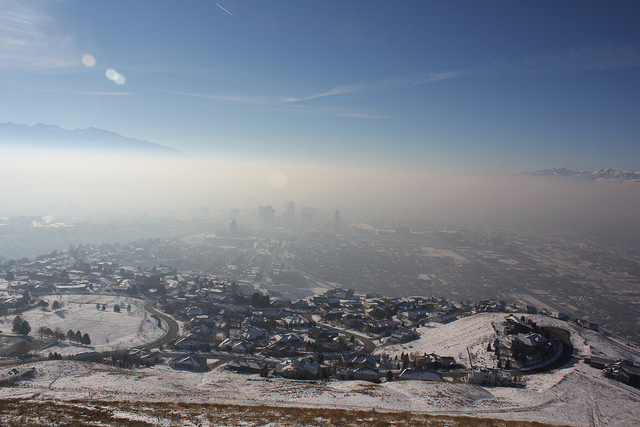 We’re just trying to get all the big athletes to put a voice out and support the cause of clean air in Salt Lake City–if you're at all familiar with the infamous inversion that happens there, you know how bad it gets. Do you feel like the athlete voice is an effective way to advocate for climate legislation? As an athlete, you put so much time and energy into your body and trying to self-promote, and ultimately there is enough time in that day to give back to something else. I think it should be a standard and a way of life for all of us to be spreading our voice. It’s pretty impactful—people respect you and look up to you. When you do something negative—people see it, and when you do something positive—people see it. We all have a choice to do whatever we like and as Americans, we’re ultimately as free as anyone could be, and we all have the option of not taking the easy way out. -A big thanks are owed to Sam Morse for transcribing the entirety of the interview with Tony and assisting in putting the final piece together.